Welcome to katherinebryan.com! Thank you for visiting. With her first Chandos recording, Katherine explores the relationship between her instrument and the human voice by providing a new take on some of the worlds most famous opera arias, from Mozart's Le nozze di Figaro and Puccini's Madama Butterfly to Gershwin's Porgy and Bess. Recorded in surround-sound, her rich and colourful interpretations are conducted by Bramwell Tovey and accompanied by the Orchestra of Opera North. Silver Voice and Katherine's other releases are available for online purchase, in CD and digital download formats. 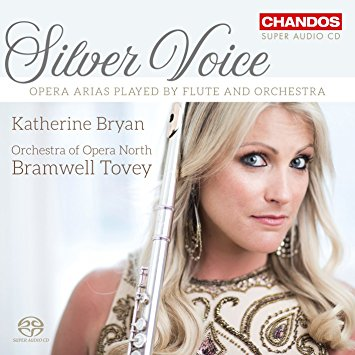 Katherine's new album of opera transcriptions for flute on Chandos Records will be released on October 27th. In February 2017, Katherine will be giving the world premiere performances of a new flute concerto by Martin Suckling. She will also play her much loved transcription of Vaughan Williams The Lark Ascending. Katherine's inaugural flute course was a huge success. A full capacity of 24 participants from around Europe joined Katherine at Ardoch, Scotland for an incredible 5 days of flute playing.